I am currently an ongoing student of Master Shi Yong Yao and Grandmaster Shi Guo Song, both senior monks from the Shaolin Temple in China. 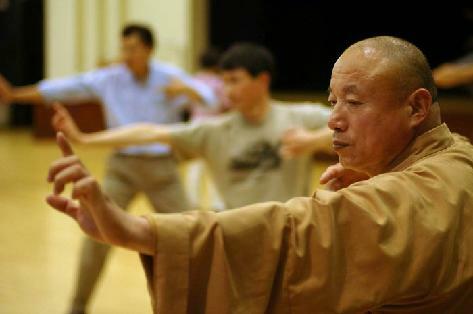 Master Song was head coach for the Shaolin Temple Kung Fu School also in China. He has taken residence in Oakland, CA. and continues to teach locally, in Canada and abroad. Masters Yau and Song teach Ba Duan Jin (8-Section Brocade) and Yi Jin Jing (muscle/tendon change classic) in addition to other traditional forms of Chinese Chi Gong. Both styles are complete Chi Gong sets and are recognized as traditional methods for cultivating mental focus, body awareness/conditioning and spiritual development. Master Yao leading a chi gong class in Oakland, CA.